The American Journal of Nursing has posted it nationally on their blog Off the Charts. So, click on the Pepsi Refresh link above, and vote for Dr. Janie’s (a pediatric Nurse Practitioner) project providing health care to Portland’s uninsured children. Peggy also sent a link to this article from the Portland Tribune, providing more information about the project. Please join me in supporting it with your vote. 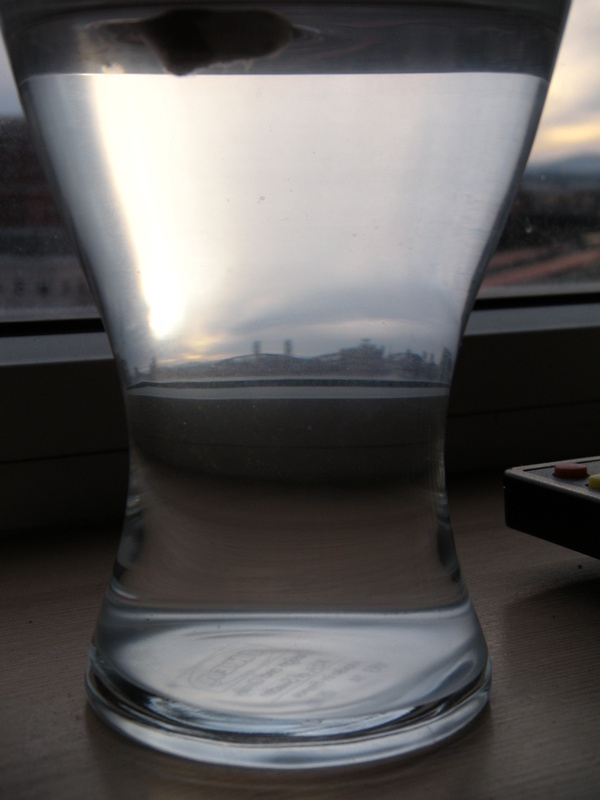 While drinking my morning coffee, I noticed a perfect reflection of Portland in a water-glass on the window sill. The glass is holding a start of a cactus I’m hoping will root. My imagination lit up to the concept of a city, held in a drinking glass. I have a dear friend, living in Nebraska, where there is a recording-breaking snow storm. The drifts of snow in her front yard stand up to 10 feet high. She’s snowed in with her animals, waiting for snowplows to remove the snow. Her Christmas cards wait on a table for mailing. A woman and her pets, held in a home on a prairie, surrounded by snow. Here in Oregon, I have the flu. (Those of you following this blog know I had the H1N1 vaccination). An artist held in the soft blankets of her bed, or sometimes the sofa. My Christmas cards remain unwritten this year. Figuratively speaking, I’m a little snowed in myself. I’m itching to get back to the studio. The balance between family and creativity is always tilted one way or another. But it’s family that makes us human, and art should serve humanity, not the other way around. A life can be snow bound for many reasons. It’s not an accident that the western New Year falls on the heels of Christmas, giving us an opportunity to start over, following a holiday season that sometimes leaves us feeling depleted, or bloated, for a variety of reasons. The snow will melt, the flu will pass. And sunlight shines on Portland in a water-glass. One of the most challenging differences between working in a hospital and my current position in an ambulatory infusion unit, for me, is keeping my patients’ clothes clean. On admission to a hospital, one of the first things a patient does is change out of his or her street clothes and into the much maligned, backless, unisex gown provided by the hospital. I always thought we made them wear it so that doctors and nurses can have quick access to the body part that we are interested in using or assessing at the moment. It’s one of the tools we’ve developed to make our jobs easier. It disguises the individuality of a person, while easily identifying them as a patient, much like the sterile drapes of an OR. But now I realize another important purpose of the gown: if I accidentally spill a drop of blood on it while drawing labs or starting an IV, it’s no big, because I can get a new one from the endless worldwide supply of them on the linen cart. Ambulatory infusion clinics are popular, from our patients’ perspective, because they avoid a hospital admission, and because of this, they are allowed, in fact expected, to wear their own clothes. We have a couple of regulars (frequent flyers) who come in their jammies and fuzzy slippers to spend the day with us, but mostly our patients dress in street clothes, often with plans of going out to lunch with a friend after a morning appointment, because Portland is a great food town. I used to ask myself why every patient I admitted for an outpatient blood transfusion wears white? (I’ve come to realize it’s because when you are very pale from anemia, the color white creates the illusion of skin tone.) White blouses and sweaters cover their chest ports, which I have to somehow access, draw a type and match from, flush, and connect to blood-primed tubing, all without spilling a drop of blood on the lovely surface of the white fabric. Maybe for most nurses this isn’t a big deal, because I never hear my colleagues complain about it. Maybe it’s just my own anxiety that my inner artist (who is a child at heart) can’t resist making a mark on any blank surface; I don’t know. I have accidentally dripped blood on a few patients, despite being careful, and I feel awful when it happens. But it is the nature of the patients I care for, and particularly the nature of oncology patients, that I have always been forgiven. The gift of life-changing illness for most patients, I have found, is that they don’t sweat the small stuff. And I love them for that. Poll: Is Portland America’s #1 Unhappiest City?